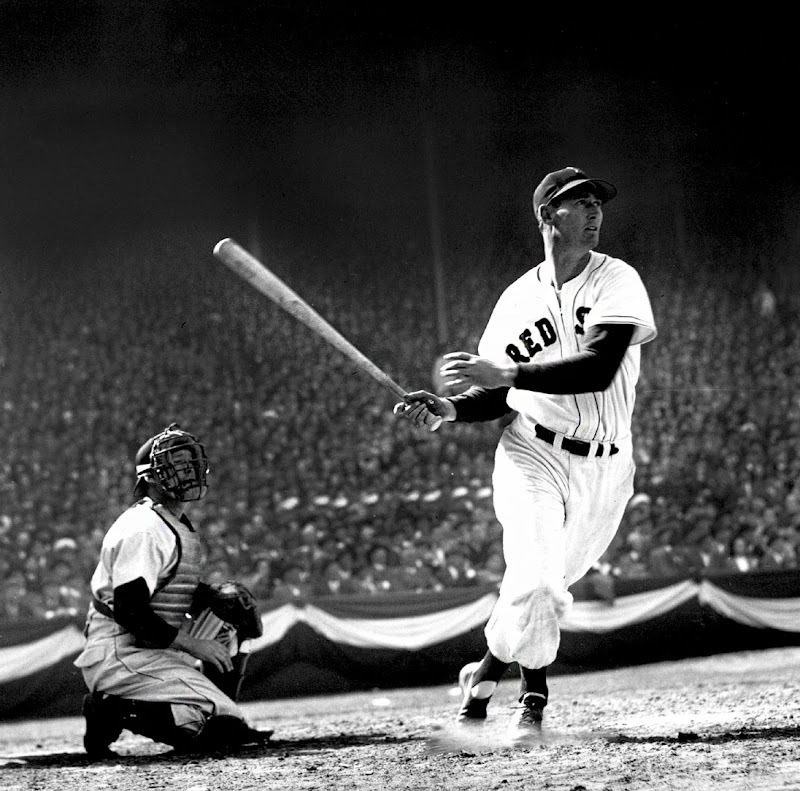 Ted Williams is considered to be one of the greatest baseball legends that ever lived. Ted Williams Major League Baseball career spanned 21 years and the entire time he played left fielder for the Boston Red Sox. He began his major league career in 1939, and in 1942 had to leave to fight in World War II as a U.S. Marine Corps fighter-bomber pilot. He restarted his career in 1946, and continued through 1960. He was an All-Star nineteen times, and enjoyed a career batting average of .344, while hitting 521 home runs. Ted Williams was the last Major League Baseball player to bat over .400 in a single season, which occurred in 1941 when he hit .406. 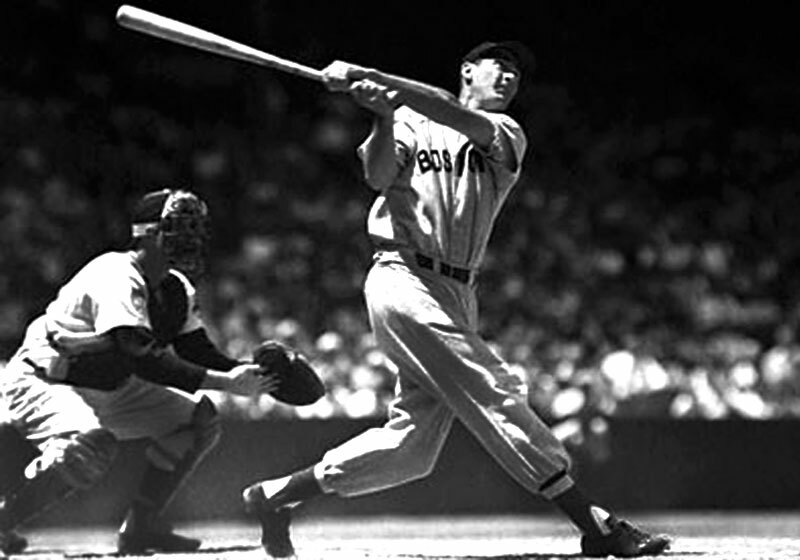 To this day, Ted Williams maintains the record for highest career batting average of anyone with 500 or more home runs. 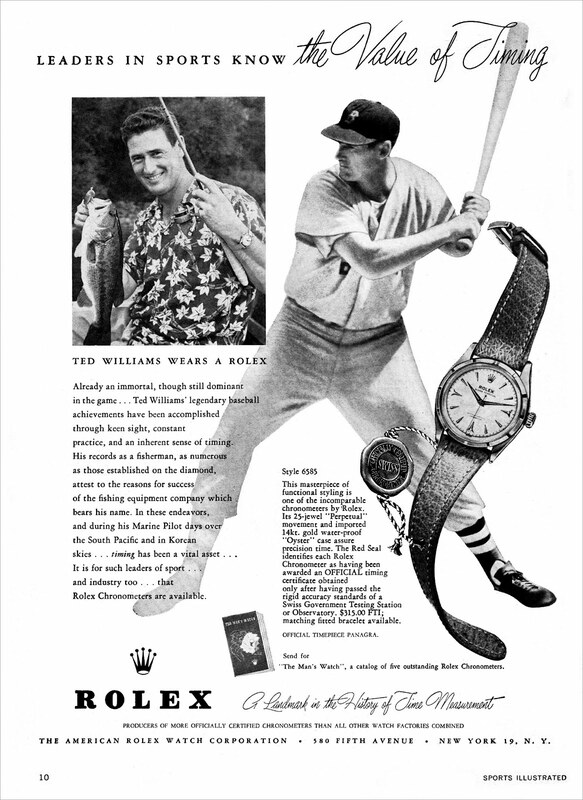 Ted Williams was an avid sport fisherman, as we see in this 1955 Rolex ad which appeared in Sports Illustrated. Ted williams is pictured above sporting the a Rolex Oyster model with a white dial. It appears to be a very similar model to the one Sir Edmund Hillary wore when he conquered Mount Everest just two years prior in 1953. When we think of Rolex brand ambassadors, or as Rolex referes to them as "Rolex Testimonee", we think of Roger Federer, Sir Jackie Stewart or Jean-Cluade Killy. We even think about Mercedes Gleitze, Björn Borg, or Sir Malcom Campbell, so it's interesting to also see one of the greatest baseball players to ever live as a vintage Rolex Testimonee. 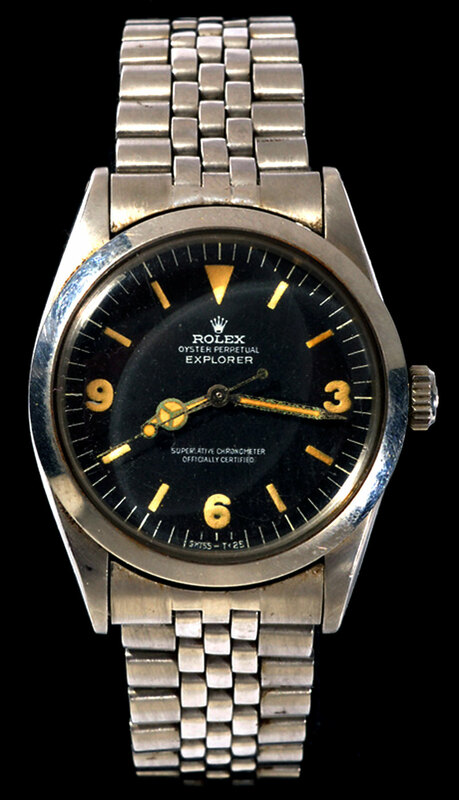 This next Rolex Explorer also belonged to Ted Williams. It appears to be a 1960 Rolex Explorer model. The watch is unusual in that it has a Rolex Jubilee bracelet, since these models typically came with a Rolex Oyster bracelet. 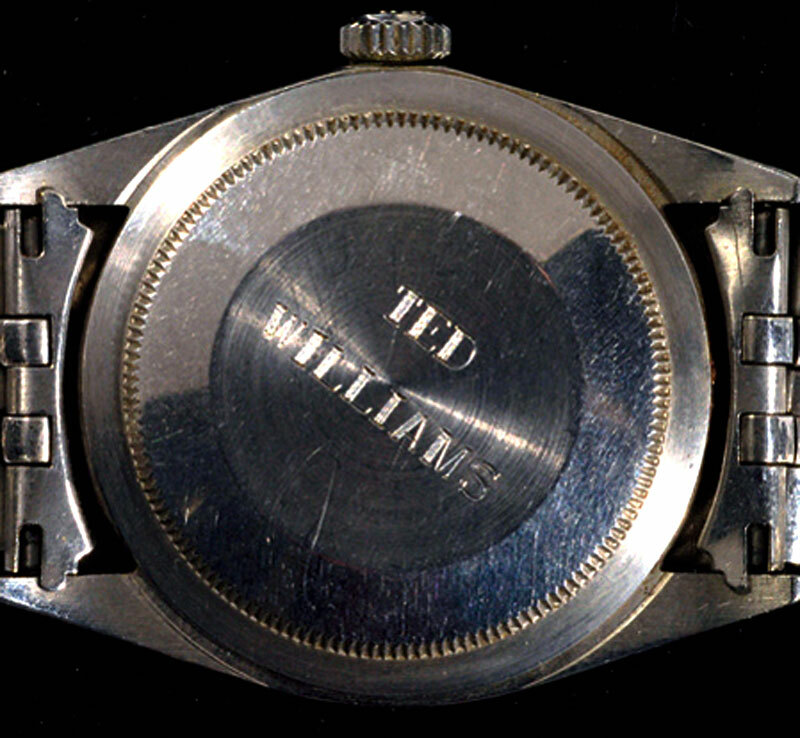 In the photo below we see Ted Williams Rolex Explorer which is engraved on the outside of the case back with his name. 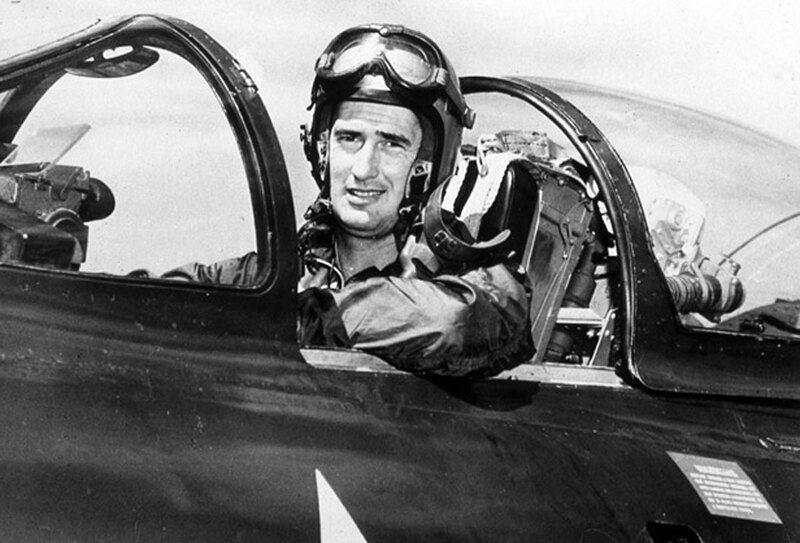 Ted Williams was in the absolute prime of his baseball career, when in 1942, in the middle of World War II, he was drafted into the Marine Corps and served as a Naval aviator. As a U.S. Naval aviator, Williams broke records in aerial gunnery and broke the all-time record in reflexes, coordination and visual reaction time. 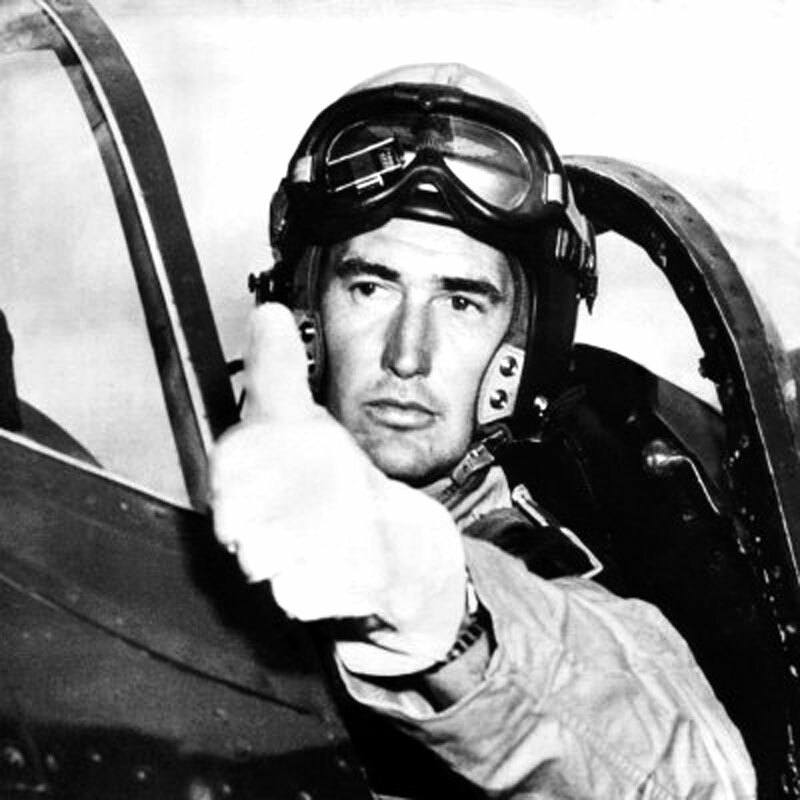 In 1952, at the age of 33 Ted Williams was recalled from a list of inactive reserves to participate in the Korean War where he flew 39 combat missions. In a twist of fate, during the Korean War, Ted Williams served in the same Marine Corps unit as John Glenn, and Williams ended up being John Glenn's wingman. Williams returned back to his baseball career in 1953. "Hiya, kid. You remind me a lot of myself. I love to hit. You're one of the most natural ballplayers I've ever seen, and if my record is broken, I hope you're the one to do it." 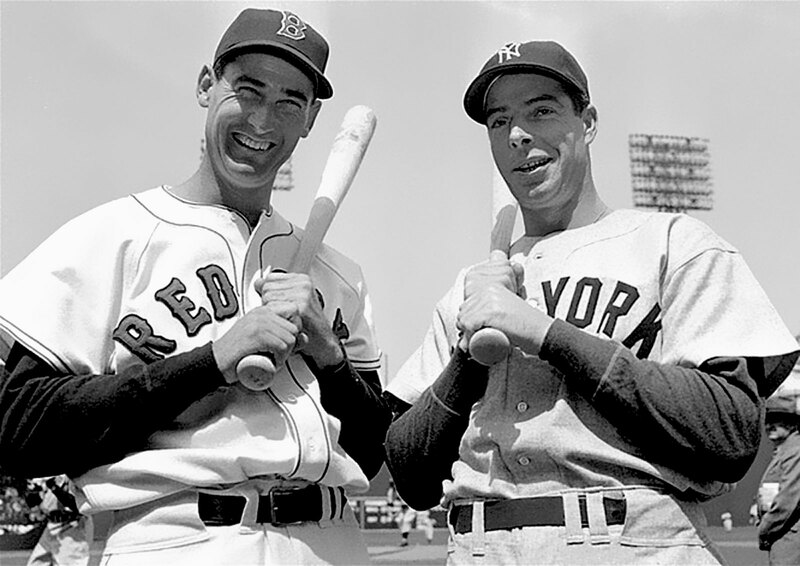 Ted Williams is picture below with another one of his role models, Joltin' Joe DiMaggio. 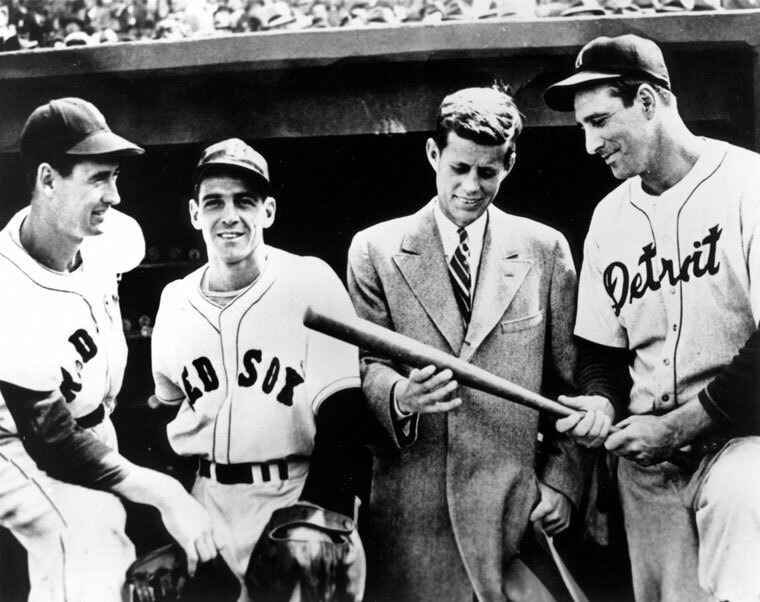 President Kennedy grew up in Boston and was not only a big Red Sox fan, but also a great admirer of Ted Williams. In the photo below, taken at Fenway Park, Boston, in April of 1946, we see Ted Williams, Eddie Pellagrini, JFK and Hank Greenburg. 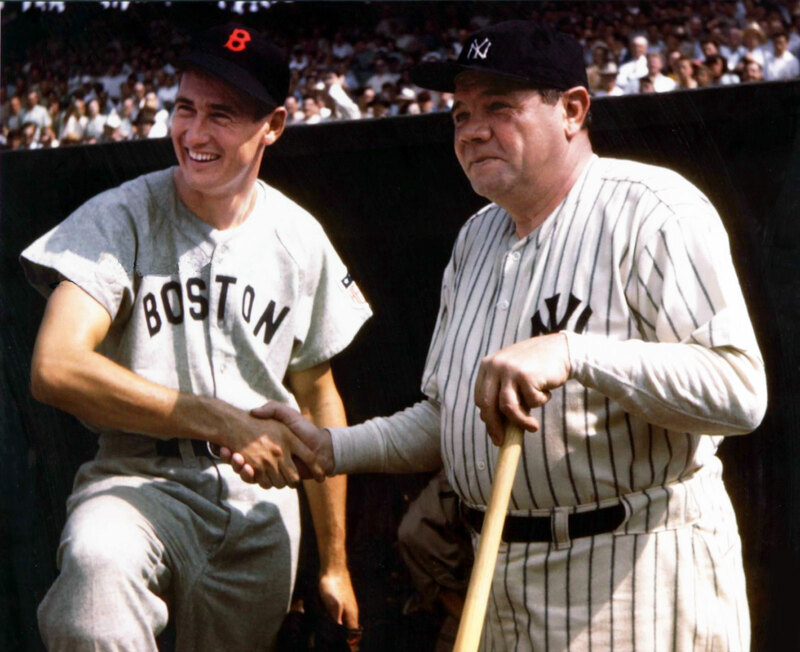 Ted Williams said that in his lifetime he never asked a baseball player for an autograph, with the exception of Babe Ruth. 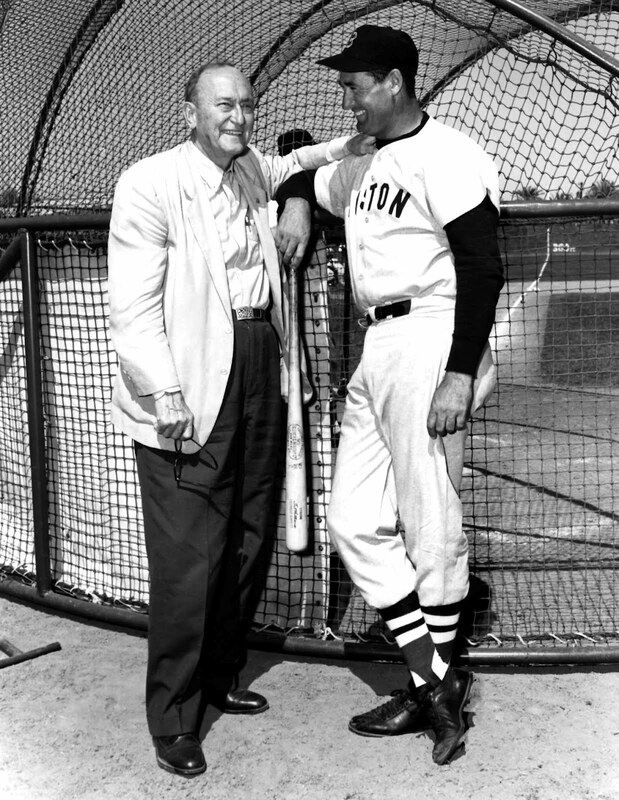 Here is a photo of Ty Cobb with Ted Williams who was one of his idols growing up.